Delton...the bank is still processing my paperwork for that IOU I was supposed to send. Check is in the mail. I wrote "Blackmail Payment" in the memo. @ Will.. when I get it, I'll deposit it first, then wait for it to clear, then tell you that you're good to go! HandgunHTR and Blakely, I got your checks today, you're good to go! Thanks and good luck y'all! Sorry it took so long. I figured the postage would be cheaper if I waited to send it from home instead of sending it from Scotland. Me and my son intend to join in and we do not have to be on the same team...however we have no problem being a team and it might be more fair to others. Neither of us has killed a deer and we are relegated to public land. 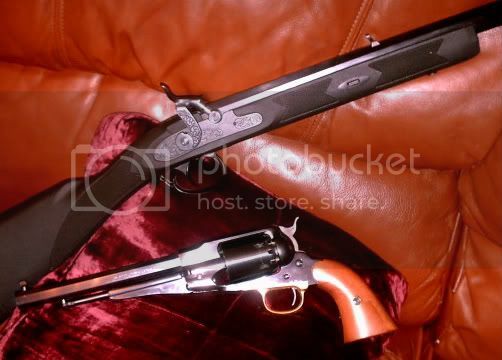 I have aquired another Ruger Old Army and a 50 call caplock pistol, have no pictures as yet but I will post them. Ruger Old Army and Ruger GP 100 6" 357. Pietta 1858 Remington. Disregard the caplock rifle. I will be using one of the guns in the link below. From top to bottom - 7 1/2" Redhawk in 44mag, 6 1/2" Blackhawk in 41mag, 4" S&W 28-2 in 357mag, and 5 1/2" Redhawk in 41mag. 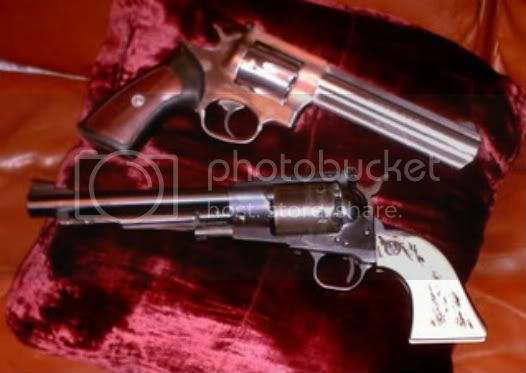 I, most likely, will not use the 357, as I prefer the bigger guns for hunting. I just put it in the pic, in case I get a wild hair. Folks, tv-racing-fan and his son want to join in the challenge as a team, like special K and his son... Tv-racing-fan's son is 21 years old and not a member here. Any objections to them sending in $40 for an entry fee, and being a team, with other teams being drawn? If so, speak now please. Looks like you and your son are a team! Good luck to y'all... PM sent with my address. What is the handgun challenge guys?? Read the very first post of this thread, and you'll see what it is, how it's ran, the rules, prizes, and how to enter it if you're interested. special K & son, I got your check today. Y'all are good to go! Good luck to y'all this season! Chad, Will, I got your checks you're good to go! Good luck to y'all! Checks?? I thought i put Monopoly Money in there? ?